We are a non-profit organization with a mission to promote Canadian science and train Canadian science communicators. We are Canada’s largest aggregator of science blogs, syndicating 150 member blogs covering topics from astronomy to zoology, policy to politics, with an annual readership of 51,000 page views and 5,500 Twitter followers. We are a trusted hub for the public, media, educators, scientists, and policymakers to discover and connect with Canadian science. Not only do we promote the work of scientists, but we also provide training and mentoring programs in science communications. Our Pitch & Polish program and New Science Communicators workshop are designed to help science students learn to communicate technical information to broad audiences. This not only helps spread stories of great Canadian science, but also helps individuals develop valuable science communication skills to further their careers. 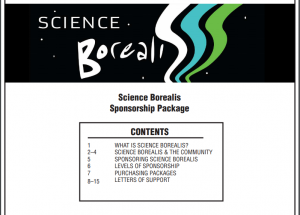 Science Borealis is a non-profit organization run by a passionate team of over 40 volunteers, who committed over 3,500 volunteer hours in 2017. Our operating costs are currently supported by generous sponsorship from Genome Alberta. Show your organization’s commitment to bringing good engaging science to the public. Promote fact-based science stories, free of sensational claims, pseudoscience, and misinformation. Support students who are committed to learning the skills necessary to write high-quality science stories. We are asking for your support to help develop our capacity to communicate and promote Canadian science. Specifically, we would like to secure funds to pay a part-time Managing Editor for our Borealis Blog, which serves as our venue to train new and emerging science communicators. That role, currently a volunteer position, includes management of our Editorial Team (27 volunteer writers and editors). We would also like to secure funds to pay a part-time Outreach Manager, who works to connect our organization to the broader science communication community. Finally, we are also seeking support for the technical costs of maintaining our website. We believe that communicating the science done at Canadian institutions, including universities, government, and think tanks, is in the public interest. With the decline in reporters assigned to the science beat, however, this task increasingly falls to researchers themselves. Science blogging has become a common media outlet: no longer new or disruptive, but accessible and educational. Our bloggers include science communicators, science graduates, current students, postdocs, and professors from universities across Canada. We provide a platform for these scientists to increase public understanding of and appreciation for science, and to demonstrate the value of investing in research for the public good. Please see below for our sponsorship package, outlining not only what we can do for you, but attesting to the value of investing in the work we do and the community we interact with. We are working to better inform the public about the great research done at Canadian institutions, but we can’t do it without your support. Please contact us at contact@scienceborealis.ca for further discussion or information. To learn more about sponsorship opportunities, download the sponsorship package.